Kolkata, May 2: In a major operation to combat against smuggling, the Border Security Force bordering the Indo Bangladesh borders today seized 100 kilos of tortoise bones. The Border Security Force has seized these smuggles in two different operations in Malda district of West Bengal and apprehended three persons in this connection. 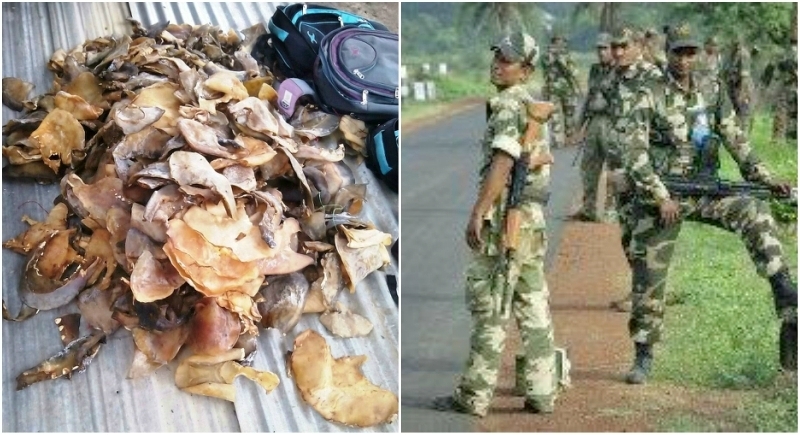 Acting on a tip off, the BSF troops in association with the state forest department in two different operations seized five bags stacked with tortoise bones from NBSTC bus in Malda, West Bengal. Each bag contained around 12 kgs of tortoise bones and in this act three accused were arrested who are identified as Arvind, Shashi Kapoor (38) and Kishan Kumar (45) who hailed from Uttar Pradesh. In first attempt the BSF detained over 60 kilograms of semi-dry tortoise bones packed in five bags. In the next attempt, the BSF personnel seized 40 kg of tortoise bones from a house at Chakmailpur village under the jurisdiction of Kaliachak police station. The smuggled bones were likely to be sent to Bangladesh. The apprehended persons and the seized tortoise bones have been handed over to the Customs department at Kaliachak in Malda district for further action. The contraband was likely to be smuggled from India to Bangladesh from the Sasani Border Area.